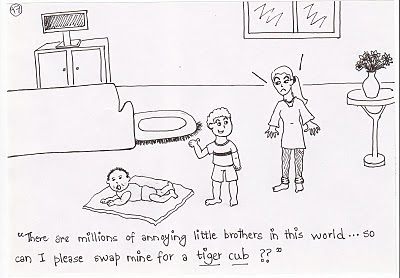 There are millions of annoying little brothers in this world... so can I please swap mine for a tiger cub?? THIS POST IS AN ATTEMPT TO BRING TO LIGHT THE CURRENT CRISIS THAT THE TIGER POPULATION IS FACING IN OUR COUNTRY. THERE WERE 40,000 TIGERS IN INDIA AT THE START OF THE CENTURY, BUT NOW THE NUMBER HAS DROPPED TO A SHOCKING 1411.... AND THAT TOO ONLY A DECADE LATER. THE saveourtigers CAMPAIGN HAS KICK STARTED A SERIES OF RESPONSES FROM PEOPLE IN THE FORM OF ARTICLES, ADVERTISEMENTS, SMS'es, BLOGS ETC. I'D LIKE TO CONSIDER THIS PARTICULAR P-TAP AS A SMALL CONTRIBUTION IN SAVING OUR BEAUTIFUL NATIONAL ANIMAL.